The first time I heard about ribbon mics, I thought they were some kind of obsolete relic in the recording industry, which played no important role in today’s modern recording studios. I proved myself wrong. I read articles about Royers and Coles and thought about all the cool LDCs I could buy for the price of one of these mics. Yet, I was intrigued by the ribbons. I read a lot of posts on Gearslutz, SOS and elsewhere, and realized that I was having a GAS-attack! As usual, I started researching, to build up a healthy appetite. I quickly turned to my favorite music retailer Thomann. I’m situated in Denmark; Thomann is the biggest player on the European music retailer market. 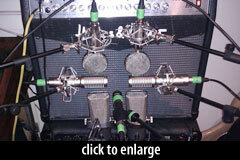 On their website, I found three interesting Chinese ribbon mics: The T-bone RB100, RB500, and RM700. I ordered a pair of each to try them out as drum overheads and on other sources. I wanted to be able to A/B/C test the recordings of each source to make a qualified decision on which mics to buy. The RB100 is the smallest of the three mics and therefore the easiest to place and squeeze into a tight spot. The design is clearly inspired by Royer microphones. You have to look for the small “8” figure on the mic, to spot the front side of it. It comes with a spider-style shockmount, which feels cheap and also conceals the directional indication on the mic when mounted. It comes in a small wooden box with velour lining colored red, yellow and purple! The largest mic out of the three tested is the RB500. It is BIG and therefore also a bit of a challenge to position optimally. The design reminds me of an old RCA 44 or 74. It sits in a yoke mount and has an XLR-lead fixed to it which can’t be removed without disassembling the mic. It took me a while to get accustomed to it, and figuring out how to move it around but now I find it quite neat. This one comes in a padded bag. The RM700 design is a bit unusual, but the mic resembles the (in)famous Cascade Fathead. Like the RB100, it comes with a very fragile shockmount similar to the one that came with the RB100 and it also conceals the directional indication on the mic. The mount makes it difficult to position the mic up-and-close to the grill cloth of a guitar amp, without tilting the mic. The ribbon was slightly crooked to one side on one of the two RM700s. This had a noticeable negative impact on its ability to reproduce sound. The RM700 comes in a wooden box with white velour lining. My test procedures were not scientific, and I would have changed some of my choices and parameters today. I set all the mics up next to each other, to yield the same performance with each. This gave the mics slightly different positions during the test, but I did keep the distance to the source as similar as possible across the different mics. No processing was carried out except from panning the drums OH as mentioned below. All six mics were tested at the same time, along with a Shure SM57 as a reference mic. 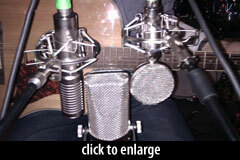 All mics were positioned in an equivalent distance from the edge of the speaker and the cone. I used all 6 mics to be able to discover differences between mics of the same model. (That’s where I spotted the crooked ribbon in one of the RM700s.) I played a Telecaster-type guitar. All the mics were set up in a spaced pair configuration. Three were placed at 105 cm (41 inches) above the snare and the other three with the same distance above the floor tom — leaving all the mics with the same distance to the center of the kickdrum. I panned the tracks 50% L/R. The drums used in the test was a Gretsch Peacock Flame kit from the 1970s. Three different mics (not the crooked RM700) were positioned at the same distance from the 12th fret, with the RB500 in the middle and the RB100 closest to the soundhole. Unfortunately, the differential set-up probably produced a difference in the mics’ performance. I played a traditional dreadnought cutaway guitar. 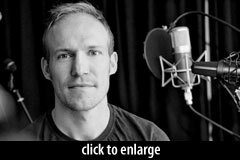 Vocals were recorded using only one mic for every performance. No instruments backed my singing up, so the key on each performance varied slightly (and the pitch you might add!) The mics were prone to pop even though I used a popfilter placed at 20 cm (8 inches) distance. This RB100 was the biggest disappointment of the three. After reading about the design of the housing and grill, I was certain this was going to be the microphone for me. However, it seemed to enhance and cancel out several frequencies, resulting in a muddy, nasal and undefined sound. As an exception, I found its push in the upper-mid frequencies, which was slightly flattering on the distorted guitar. I have seen criticisms of ribbon mics similar to the RB500, citing unwanted harmonics as well as coloration due to the mesh grille. Whatever it does, I think it does that just right. It seemed to produce a hint of compression, saturation, and/or distortion, which made the sound a bit more interesting. In one word, it made the sound “rich.” It reproduced the sounds it picked up more linearly than the other mics, without the low-end roll-off most LDCs have. In spite of this, it definitely stood out as a “character” microphone, rather than a neutral one. It excelled on every recording, especially for the drums. 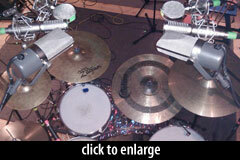 The mics’ position on the OH recordings did favor the floor tom a bit too much against the kick and snare. 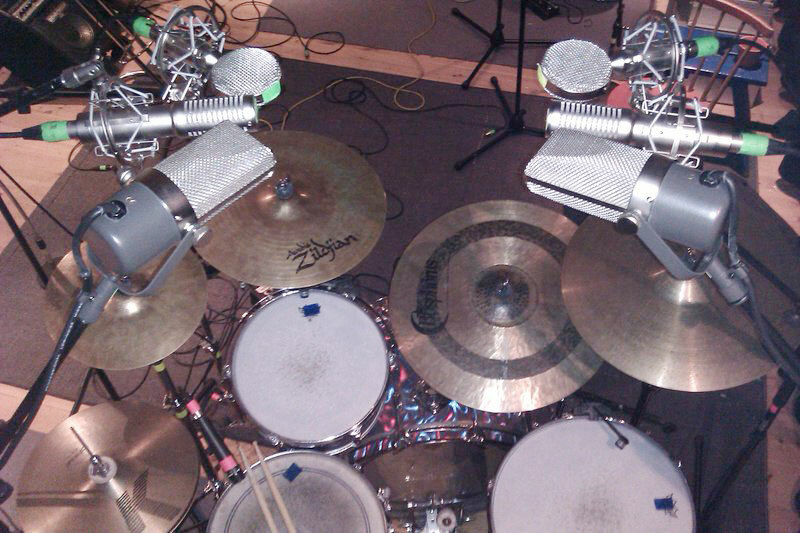 But when mixed with close mics, the RB500 really worked great, rounding off the cymbals in a lo-fi kind of way. The RM700 produced some very usable tracks. 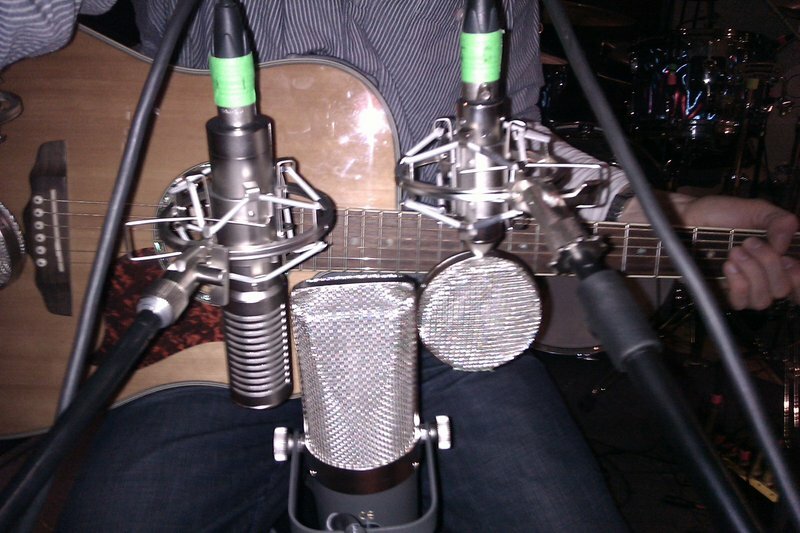 I found it to be the most clear-sounding mic, especially on the guitar amp, both for clean and distorted sound. It also performed well for the drums. On the other hand, it seemed a bit sculpted and hyped in the upper frequencies. It sounded to me as if it had a noticeable bump around 4 kHz, which isn’t always flattering. It works sometimes, but I did not like it for the acoustic guitar. It did not seem to go as low as the RB500, but instead it sounded as if it were hyped in the lower mids, which maybe could pass as low-end on smaller (hi-fi) speakers and headphones. The three mics did deliver a “meaty” tone, which in conjunction with other mics definitely could be a useful and welcome addition to many recorded sources, especially when considering the price. Not all sources would benefit from being recorded solely with the T-bone ribbons. In my opinion, you would always have to do some amount of low-frequency cutting. I ended up keeping the two RB500s, despite the attached lead and yoke mount. I love the nitty-gritty kind of subtle distortion and compression they add. I most often turn to them as my go-to drum OH in either Recorderman or Glyn Johns setup — or sometimes my own mixture of the two, combined with several close mics. I rarely record any electric guitar without one, either up-and-close or as an ambience mic, or both. I especially like an RB500 paired with a dynamic and a condenser mic. Most commonly, I choose either an MD421 , Heil PR40 or an SM57. The condenser is usually a Soundelux U195, Audio-Technica AE3000 or an SE z5600a. Paired this way, the RB500 just contributes well to making this kind of “finished” sound that I prefer. 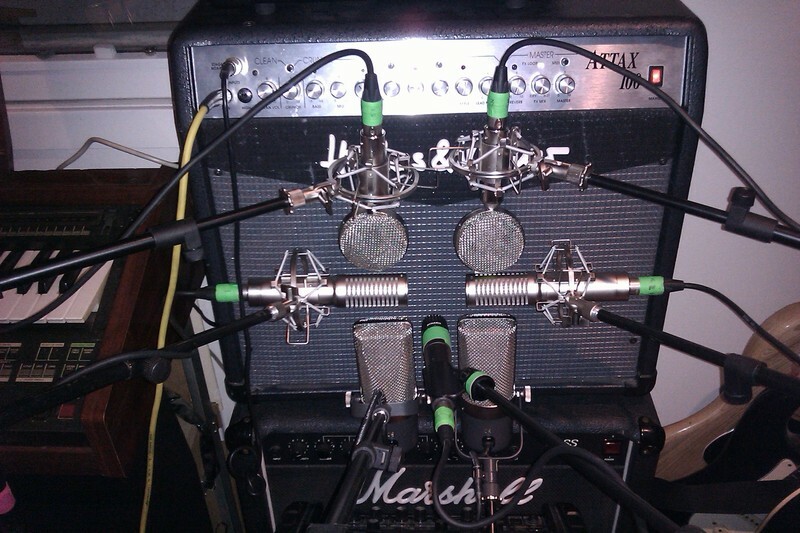 I often route the three tracks to a stereo track during mixing, and treat the three amp mics as one. I love the RB500 on bright instruments like resonator, banjo, mandolin, sax and as a drum ambience mic. Sometimes it also works well with singers who tend to have a thin voice and need excessive de-essing when recording through an LDC or if you want a lo-fi roots-like sound. I have used the RB500s for two years, and I have been amazed by the sounds I get from these two mics. It still surprises me how often I favor them to more expensive mics. 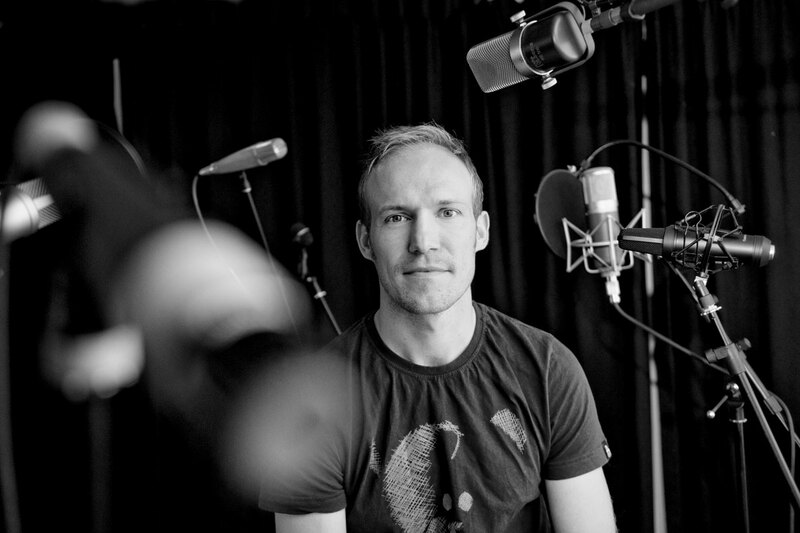 Kasper Bjerre is a professional musician and music instructor based in Denmark. 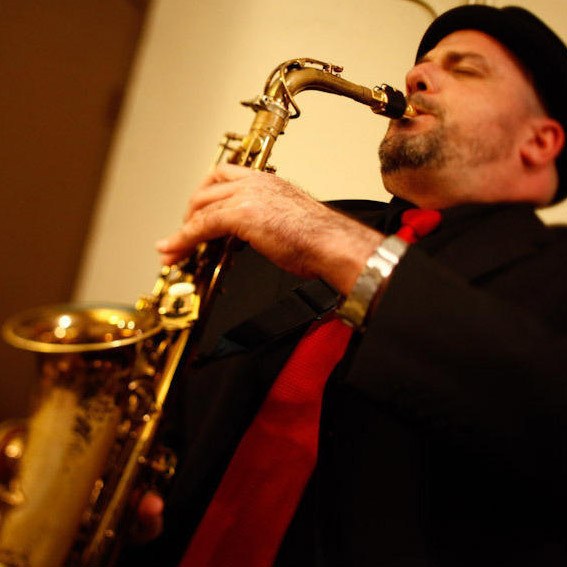 His recording studio, The Sound Salon, specializes in live-in-the-studio band sessions. Visit Kasper online at his bands’ sites, The Cornfeds (bass) or Jay Beez Funk Club (drums). If you enjoyed Kasper’s studio test of inexpensive ribbons, be sure to check out the $60,000 Ribbon Mic Shootout, which lets you compare 30 different ribbon mics (from 17 vendors) on drums, acoustic guitar, character voice, guitar cab, and sax. Is the attached cable easy to replace? Since I make it a point to at least peruse everything that Matt publishes here, I skimmed the article and just wanted to point out that “infamous” means famous for negative reasons as in “a day that will live in infamy.” Unless I’m not aware of something negative associated with the Cascade Fat Head, I do believe the author meant to say “famous” instead. I would never bother to mention such a thing on just any old blog or web site but I do care about the content on REcording Hacks. If you had to choose between the Cascade Fathead and the RB500, which would you choose? @Big Dave: With a soldering iron, I guess it wouldn’t be to difficult. @Slau: I meant to say both famous and infamous, denpendent on whom you ask about the Fathead. @Kris, take a look at the “chinese ribbon mic buyer’s guide,” http://hac.kz/1/118 … it helps explain the different sonic profiles of the two ribbon motor designs found in the RM700/Fathead and the longer-geometry RB500/Vinjet. See also the “$60,000 ribbon mic shootout” linked above; you can plainly hear that the shorter Fathead-style ribbon motor attenuates high frequencies more than the longer ribbon in the RB500 style. Regarding the brand choice, Cascade’s mics are a bit more expensive, but tend to include nicer accessories. Also, the Cascade team checks all the ribbons, so unlike Kasper’s experience with t.bone, you won’t get a crooked or saggy ribbon in a Cascade mic. 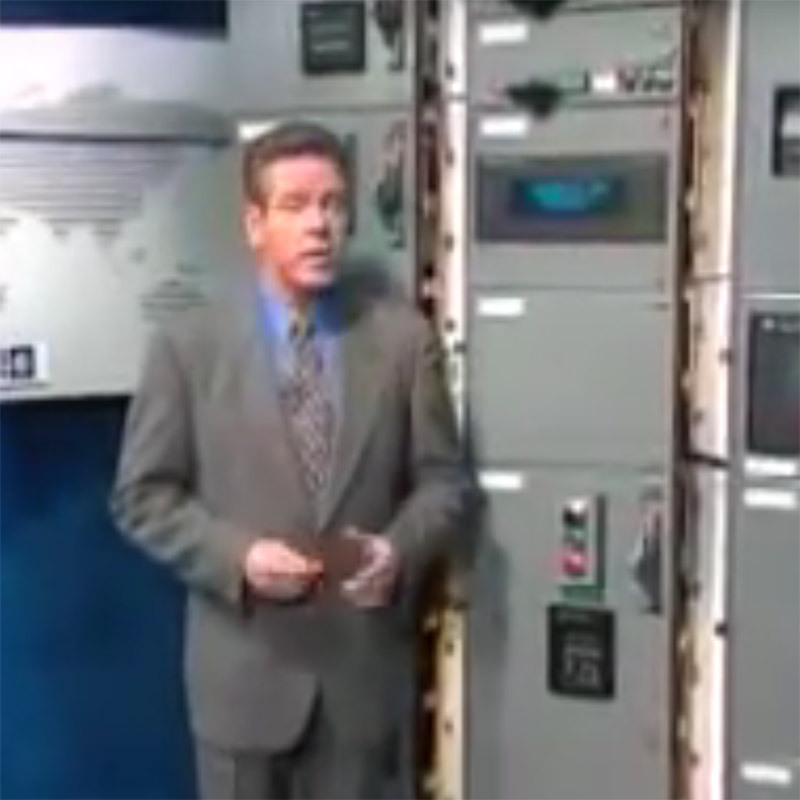 For general-purpose use, I would get a Cascade Vin-Jet with an upgraded transformer. I find the Fathead style too colored and dark — although sometimes that’s just the thing for guitar cabs. I would agree with Matt’s recommendation of the long ribbon short path types as the most versatile because of the wider frequency response but l also feel that upgrading the ribbon and motor to transformer wiring to be equally important to a transformer upgrade. Wish you had a FatHead or Royer 121 to compare these to. I’m also interested to hear the new active/passive FatHead. Really interesting reviews. I have an RM 700 and always use it for guitar cabs – it sounds so much more like an amp in a room once recorded than say a 57. Also fuller and sonically more interesting. It’s almost impossible to put it somewhere that doesn’t sound good! The RB500 sounds good too though from the clips. I too don’t like the attached yoke and lead. The RM700 has a shockmount and comes in a proper wooden box. I’ve never tried it as an overhead (I usually use a AT4033) but I’ll certainly try it now. Mentioning the AT4033, this is my go to for acoustic. Always sounds wonderful.